proved to be a life-changing experience. From 1996 to 1998 he studied at the Edward Said National Conservatory of Music in Ramallah. In 1998-2005, Ramzi received a scholarship to study viola at the National Regional Conservatory of Angers (France). Ramzi graduated with a DEM in viola, and chamber music. At the French conservatory, Ramzi met up with other students with whom he created the Dal’Ouna Ensemble in 2000. Today Ramzi splits his career amongst many projects. 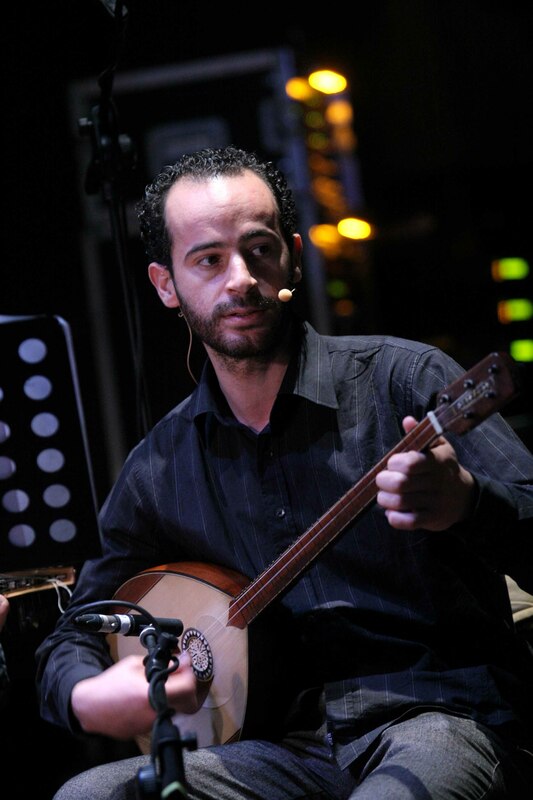 He is concert performer, bandleader of Dal’Ouna, musical director, composer and arranger for the Palestine National Arabic Music Ensemble, and viola soloist performing Western classical music with chamber music ensembles and orchestras throughout the Middle East and Europe. Ramzi’s deep engagement with Palestinian youth led him to realize a lifelong dream in 2005: the creation of the Al Kamandjati Association. Al Kamandjati’s mission is to bring musical education to Palestinian children and, in particular, to those who are most vulnerable – the children of the refugee camps. Al Kamandjati teaches more than 500 children per year from the refugee camps of Al Amari, Jalazon, Tulkarm and Qalandia, in the village of Deir Ghassana, and the cities of Ramallah, Jenin, Gaza City and Hebron in Palestine. In Lebanon, Al Kamandjâti runs music schools in the refugee camps of Bourj el Barajneh and Shatila. Nidal Ibourk is a virtuous singer and an exceptional scholar in the U.S. Nidal was born in Rabat, Morocco and moved to the U.S. in 2006. Upon graduating with her Bachelor Degree in English Studies from Ibn Tofail University, Nidal received a full scholarship from the U.S. State Department to complete her postgraduate studies at Kent State University. In 2008, she earned her second Bachelor’s in Organizational Communications and recently obtained a Master’s Degree in Human Resources Training and Development. Her fine music talent and interpretation of much of the Arab traditional music repertoire led to her collaboration with internationally renowned musician such the Violin and Oud master Simon Shaheen. Since 2008. Nidal performed in distinguished venues in Morocco and abroad such as the Festival of Rabat, festival of Marrakech, Festival of Youth Music, Musicana Top 10 and Star Search on MBC channel and the U.S. embassy in Rabat. What distinguishes Nidal as an artist is her commitment to preserve her cultural heritage and present a genius repertoire of classical Arabic and Moroccan music. Her sophisticated presence on stage is not only reflected through her fine selection of songs, but also through her traditional outfits that shows her pride in her roots. As an active speaker in universities and community events, Nidal has spoken to a wide range of youth on her cultural background and her experience in America as a young successful Singer. TAREQ RANTISI was born in Jerusalem, Palestine. Self-taught, he began his career playing Middle-Eastern percussion and has performed in concerts and music festivals throughout the Arab world and Europe. In 2008, Tareq received the Al-Qattan Foundation Music Scholarship to attend the prestigious Berklee College of Music in the US, receiving a degree in Percussion Performance and graduating with honors, covering jazz to Afro-Cuban to Carnatic Indian to Brazilian and more. He has performed with Paul Winter, Simon Shaheen, Aaron Goldberg, Srinivas Krishnan, Victor Mendoza, Mehmet Ali Sanlikol, Bruno Råberg, Javier Limón, Pepe de Lucía, Glen Velez and many other virtuosic musicians, composers and ensembles. Tareq has also developed a body of educational work, offering master classes, workshops and private lessons throughout the world in collaboration with Arabic Music Retreat, Brandeis University, The Center for Arabic Culture, NAFDA, The Gaza Music School, Qattan Foundation, Al Kamandjâti Association, Kufiyyeh Center of Music, and the Yamaha Music School. 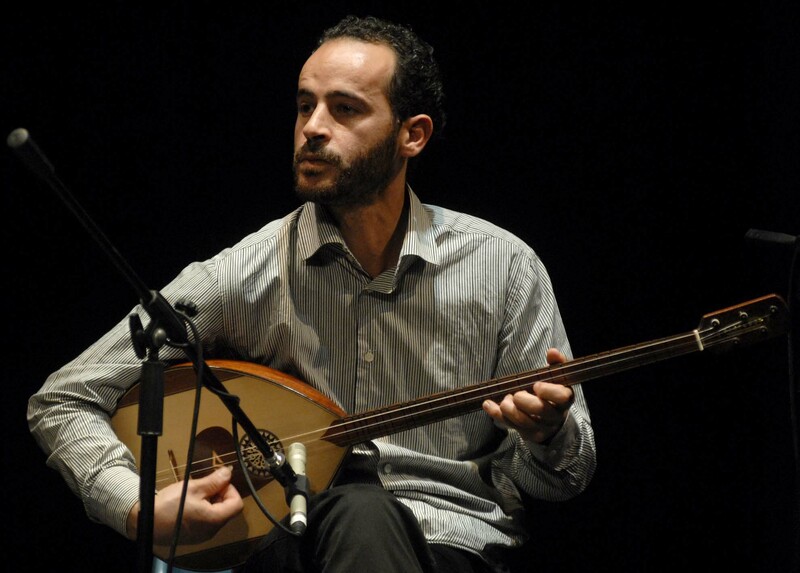 ZIAD BEN YOUSSEF’s passion for the oud began in his native Tunisia, encouraged by some local masters who introduced him to the world of "Eastern Maqam", the main foundation of oriental music with roots in Arabic, Persian, Turkish, and Armenian traditions. His musical path was forged with the Bashir brothers, Ali Sriti, Farid Ghosn, Anouar Brahem, Saliha, Manolo Sanlucar, Sabicas and many others. Ziad continues to pursue his goal of expanding the boundaries of this instrument vis à vis improvisation and exploration of diverse musical traditions, including Flamenco, Eastern European, jazz and other contemporary music. Ziad has ventured into the world of theater and has participated in numerous projects such as "The Thousand and One Nights "with English director Tim Supple, poetry performances, and film soundtracks: “Happiness” (Alexander Medvidkine), “Kedaba” (ElHachmia Didi Alaoui), “ADN, Ame de la terre” (Thierry Obadia), and "Tomb of the Lovers" performed live at the Louvre Auditorium. EDWIN BUGER, renowned accordionist and multi-instrumentalist from France and born in Yugoslavia, discovered his love of music early on, thanks to his father who plays guitar and sings. At age 12 he began to perform at weddings, and at 16 he played guitar and accordion for dances with numerous bands in Bavaria where his parents had settled. In his late teens, Edwin played in the rock band “Sauerkirsch” and soon thereafter took up the saxophone and performed in the French Legion marching band for five years before he was sent to the military conservatory in Versailles. He later settled down in Toulouse and played dance music in the villages in the Pyrénées region. His next move was to Bordeaux where he was introduced to the music of Madagascar and Martinique, French gypsy jazz, and a broad range of Arab and African traditions. 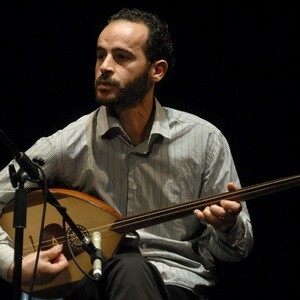 He released his first jazz album in 2010 featuring Ziad Ben Youssef on Oud and Thierry Lujan on guitar. When he’s not touring and performing, he is the church organist in his home community. His musical horizons are forever expanding. SANDY TOLAN is author of The Lemon Tree: An Arab, a Jew, Heart of the Middle East, which has sold more than 250,000 copies in six languages, and his new book, Children of the Stone: The Power of Music in a Hard Land. He has reported from more than 35 countries, mostly in Latin America and the Middle East, written for more than 40 newspapers and magazines, and produced hundreds of documentaries and features for NPR and Public Radio International. His work has focused on the intersection of land conflicts, racial and ethnic identity, natural resources, and the global economy. He is a co-founder of Homelands Productions, an independent production company focusing on documentary work for public radio. Sandy has garnered more than 25 national and international journalism awards. He was a Nieman Fellow at Harvard and an I.F. Stone Fellow at the Graduate School of Journalism at UC-Berkeley, where he taught from 2000-2007. Currently he is Associate Professor at the Annenberg School for Communication and Journalism at the University of Southern California. Two images side by side on a poster. One shows a raging eight-year-old Palestinian boy throwing a stone with his right hand at an unseen Israeli soldier, while another stone is clutched in his left. The other picture has the same young man a decade later, pulling a bow across the strings of a viola. That pair of photographs was the beginning of a path that’s brought viola player Ramzi Aburedwan and the Dal’Ouna Ensemble to tour the U.S. from September 15-October 3 (see tour schedule below) with award-winning journalist Sandy Tolan, who’s written Aburedwan’s inspiring story in his remarkable book, Children of the Stone: The Power of Music in a Hard Land. By the time they met, Aburedwan had just returned from New Hampshire, where he’d been learning Western classical music. He wanted to study in France. But it wasn’t the end. A decade later, on entering an Italian restaurant in Ramallah, Tolan heard someone calling his name. It was Aburedwan. The Al-Kamandjati schools sit in Gaza, the West Bank, and Lebanon. Most of the students have only known life in refugee camps. The schools offer a safe haven for trauma therapy and creative resistance. By the time they met again, Aburedwan’s passion had convinced others to come and help him – a violist from the London Symphony Orchestra, a British opera singer. The schools were flourishing. Famed Israel conductor Daniel Barenboim had invited Aburedwan to join his West-Eastern Divan Orchestra. Combining Tolan’s book with music seemed a natural way to present things, so Aburedwan decided to bring his Dal’Ouna Ensemble on tour. It’s a multicultural group, with Aburedwan himself on bouzouk along with a Palestinian percussionist, a Tunisian oud player, a Croatian accordionist, and featuring acclaimed Lebanese singer Abeer Nehme. The vast majority of the performance is music, Tolan notes. He simply introduces the evening to provide the framework and reads an extract from the book. There are stories within stories, not only in Children of the Stone, but also within the music.